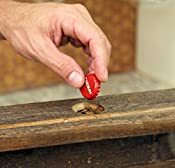 The Original Bottle Cap Drop Box - hand crafted and customized by us, brought to life by you! Wine Corks now have a place to call home. Product Description: "Fine Art 18x24"
The Fine Art Collection is our true heirloom quality display pieces. Crafted from solid Maple each piece is stained dark brown, then lightly sanded to expose subtle hints of natural wood. This collection is built with the highest level of craftsmanship and attention to detail. Solid, elegant, and classy! It comes with a 1/8th inch piece of acrylic glass with your choice of design. A 1.25in hole is cut on the top of the box to drop your corks into. The back has a saw-tooth hanger for easy and secure hanging. The top and sides are dadoed out so the acrylic slides out the top for easy removal of your corks. Hand made in our home studio in Fort Worth, TX. 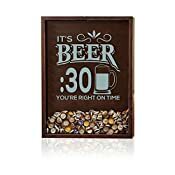 Makes a great gift idea for any special occasion including Christmas, holidays, birthdays, weddings, anniversary, father's day, mother's day, and housewarming. 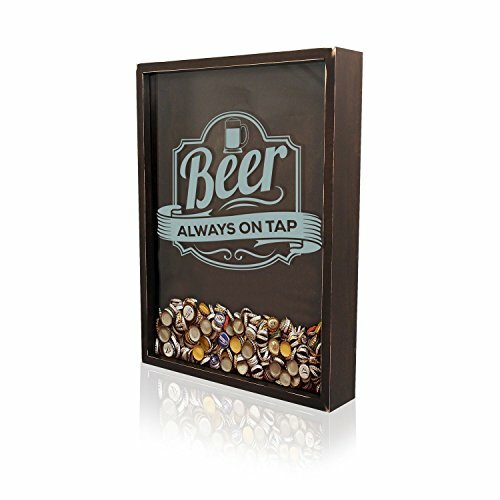 Get the perfect gift for the beer connoisseur in your life. We give a 100% satisfaction guarantee on any piece you purchase! So shop with confidence that your getting a true hand-crafted piece that will last a lifetime made by our family right here in TX!